When a book opens with, “It was dawn, and the zombies were stumbling through the parking lot… Later they’d be resurrected by megadoses of Starbucks, but for now they were the barely living dead,” I knew I was going to enjoy this book. 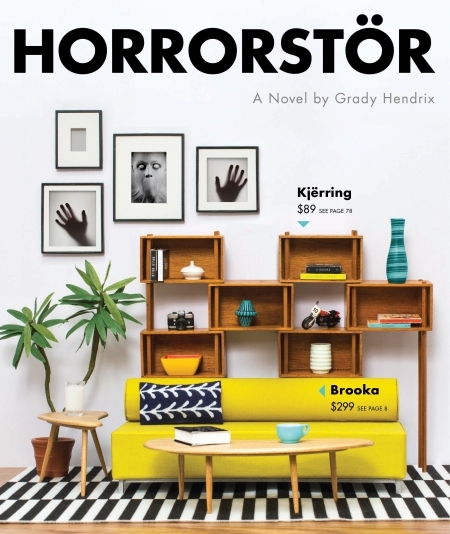 Horrorstor is a new novel written by Grady Hendrix that combines elements of a traditional haunted-house story and places it in a contemporary setting. In this case, the book focuses on Orsk, the All-American furniture superstore in Scandinavian drag that offers 220,000 square feet of retail products and a mystery, as well. The store at Orsk Location #00108 in Cuyahoga County, Ohio, is just like all the rest: It’s a big-box, corporate store that creates scripted disorientation, hoping you surrender to a programmed experience. But this store includes an added bonus: a late-night paranormal experience. Every day, the staff uncovers a series of mysterious events, including creepy graffiti, odd text messages seeking help and broken items scattered throughout the showrooms (although nothing shows up on the security cameras). Fed up with the distractions, Basil, the store manager, decides to take action. Whether it’s considered an internal investigation, a covert operation or a sleepover, he chooses to spend 24 hours within the store, hoping to camp out and catch the intruders responsible for vandalizing his store. After choosing a couple of employees to help with his secret mission and waiting for the customers and other employees leave, the store becomes spooky and barren… that’s when things really start getting strange. Apparently, store #00108 was built on the former site of Cuyahoga Panopticon, a 19th-century prison run by Warden Josiah Worth, who used forced labor to cure the weakness of the prisoners’ (aka penitents) minds. And somehow, those spirits are restless… Hoping to capture something on tape, two employees posing as ghost hunters join the hunt for answers. Will the five employees find a vandal, psychic energy or something else responsible for the early-morning mayhem? As a curious fan of haunted houses and paranormal activity, I enjoyed reading Horrorstor. With all the elements of a great mystery, including a seance majorly influenced by reality TV, this book proves there’s hope for every employee hoping to escape a mindless retail job. There’s some great (and gross) detailed imagery used through the entire book, which added to the horror aspect. In fact, this story would make a great R-rated movie — or at least a decent PG-13 one — one which I envision stars Ellen Page as Amy and features Taylor Swift as the slutty, glam-punk ghost hunter, Trinity. That would be some great big-screen casting! I love the map of the Orsk Showroom found inside the cover flap, but I REALLY love the fictional identification badge of the author, himself! You’ve got a great sense of humor, Grady Hendrix! But just like many American products you can find, the book includes many pages of unnecessary literature and instructions, forcing the reader to discern what is part of the story and what isn’t. At the beginning of the book, that can be difficult. I wasn’t sure if this was going to be a Young Adult book or haunted-house tale, but it was obviously an inspired tale of horror, one which possibly gets a sequel. I look forward to discovering more about the legendary, old-school Ohio prison. Strength: Creepy horror story with a neat twist at the end. Weakness: Not enough paranormal backstory. WTF Moment: The wannabe paranormal investigators name their EMF readers after well-known ghost hunters.